Looking for the perfect casserole to serve up for breakfast or even brunch? I made this in the new Ninja Foodi Pressure Cooker Airfryer, and it worked out fantastic. This casserole is hearty, packed with bacon, eggs, and hash browns, all your favorite breakfast foods! Comes together quickly and bakes to a perfect golden brown. You all know I love my Instant Pot, but there is a new kitchen gadget in town, and it is making waves. 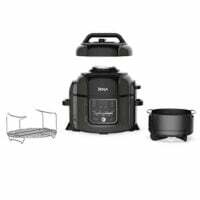 The Foodi Pressure Cooker Airfryer is a pressure cooker and Air Fryer in one. This kitchen accessory is making a lot of noise on how awesome it is. So, you know me, I wanted to be one of the first to hop on the bandwagon to give it a go! This gadget is pretty awesome, and if you are on the fence, I recommend giving it a try! 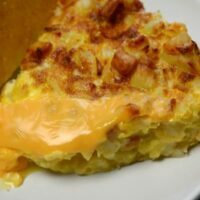 One of the first recipes I tried in it, was this hash brown casserole. I sat down and created a straightforward and easy dish to try out, and it was a success. Plus the family enjoyed eating it as well. A great breakfast option to help kick-start and fuel your day. Plus the cleanup was a breeze, and I ended up having no complaints. 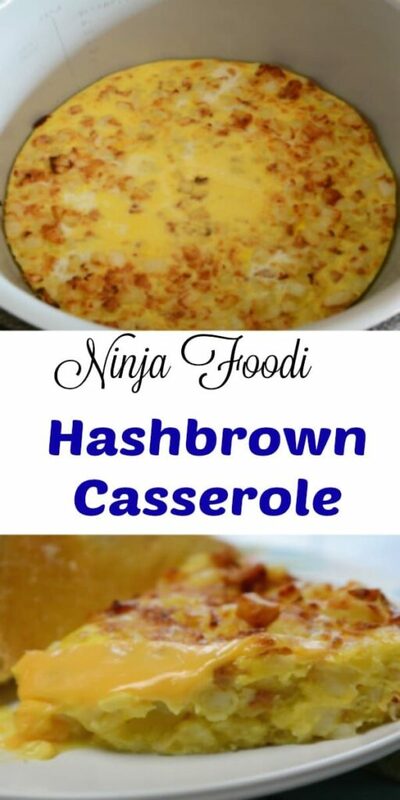 This breakfast casserole is versatile! If you prefer, use sausage or even cubed ham or toss in some diced bell pepper for added flavor. 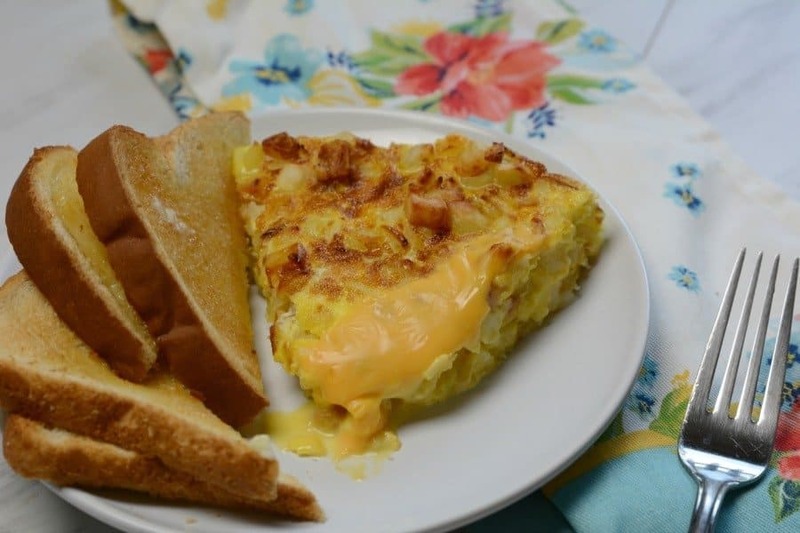 You can create a breakfast casserole to fit your taste buds. 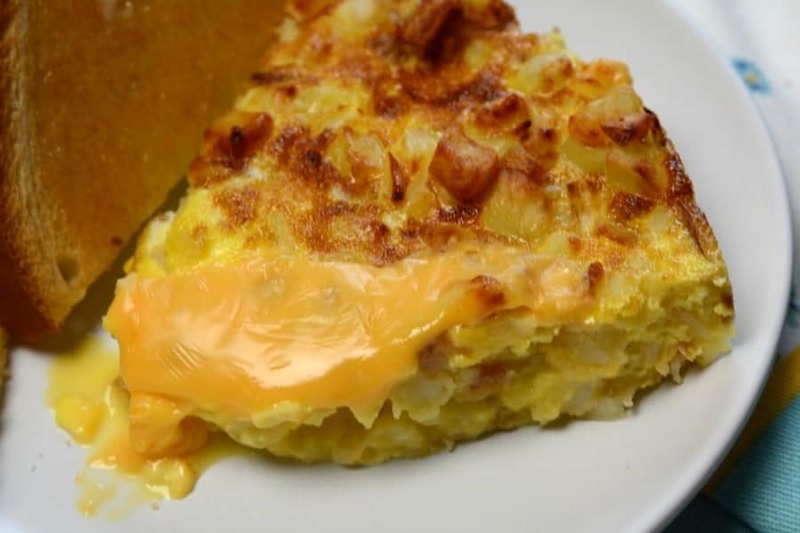 We love the bacon, egg, and hashbrown combination in our home. Eggs have been good over the years and then you hear they are bad, then back to being good for you. It is hard to know exactly what the scientist are thinking. Eggs are delicious, versatile, and have a huge laundry list of ways they can help you and your body. Let me share a few reasons why you might want to incorporate more eggs into your diet. Raises Good Cholesterol | Eggs have been known to raise the levels of HDL which is “good” cholesterol. Eating eggs is a great way to help give your cholesterol a boost in the right direction. Eggs can also help reduce stroke, heart disease, and other health issues. Healthy Skin | You will find zeaxanthin and lutein in eggs, which are great for protecting your eyes, but also your skin. These two components will help to filter out harmful blue spectrum rays that we are exposed to. By eating eggs, it can help protect your skin from these harmful UV rays. Eggs are packed full of nutrients that have been known to help ward off skin cancer. Bone Health | Protein is something our bodies need, and sometimes we fall short of the recommended amount. When you have the right amount of protein, it can help protect your bones, increase your muscle mass, and even aid in weight loss. The beauty of eggs is they are versatile in how you eat them, so they can help fuel your body throughout the day. This just skims the surface on the benefits eggs offer. I love cooking with eggs, and serving it to my family and friends because I know it is a good source of nutrients. What is our go-to breakfast dish? This casserole is hearty, packed with bacon, eggs, and hash browns, all your favorite breakfast foods! Comes together quickly and bakes to a perfect golden brown. Place Foodi on aircrisp 350 for 10 minutes or until top is golden brown and eggs are done. I enjoy your site and your recipes. But I would respectfully like to offer a suggestion. Many of your recipes are geared towards using an instapot or other cooking appliances. For those young cooks who may just be learning how to cook, and/or don’t have these appliances, suggest you include alternate cooking instructions with your recipes. When do you put the ham in? Your recipe says it has bacon. It is not part of the recipe, it says a pound of ham. It also doesn’ state what to do with either within the recipe. Where do u put ham??? What is the temperature for the air crisp? You specify bacon in the description, yet ham in the recipe. What temp for the air crisping? When do you put in the ham or bacon? Do you add the meat raw or pre-cooked? Our first one-pot meal in the new Foodi. We used bacon which we sauteed with the onion. We also used re-constituted freeze-dried hash brown rather than frozen. We were uncertain about the crisp time but it turned out that 15 minutes was fine. Since they were mixed with the sauteed onion & bacon, they did not get too brown. The result was a nicely browned egg and potato “pancake”. Quite tasty and easy clean-up. I was just given a foodi for a gift, I can’t wait to see how much I can cook!